A theory previously posited by scientists predicts that early generations of moons around gas giant planets will gradually migrate closer to the planetary bodies, eventually colliding with the planet. This migration occurs because the moon’s gravity disturbs the density of the protosatellite disk—a disk of material that has not yet formed into moons. The change in density slows the moon’s orbit and causes it to migrate into the planet. 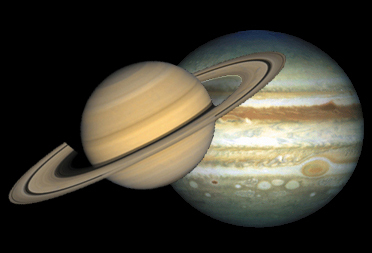 However, scientists were left with a question: Why did Saturn lose all but one of its large moons, while Jupiter has a total of four large moons? Simulations by the study’s co-authors indicate that Jupiter grew large enough to open a gap in the solar nebula, rapidly turning off the supply of material that could be used to build satellites. Lack of material in the protosatellite disk prevented the orbital decay of Jupiter’s final generation of large moons, in effect saving them from destruction. Saturn, however, did not get large enough to open a gap; material was readily available, allowing its massive satellites to gradually migrate toward and collide with the planet. Simulations by the study’s co-authors indicate that in this scenario, most large moons are lost to orbital migration, and a single massive moon in orbit around the planet—similar to Saturn’s Titan—is the likely outcome. For more information, please contact the LASP Office of Communications and Outreach at info@lasp.colorado.edu. Takanori Sasaki, Glen R. Stewart, and Shigeru Ida. 2010. Origin of the Different Architectures of the Jovian and Saturnian Satellite Systems. ApJ, 714, 1052-1064.